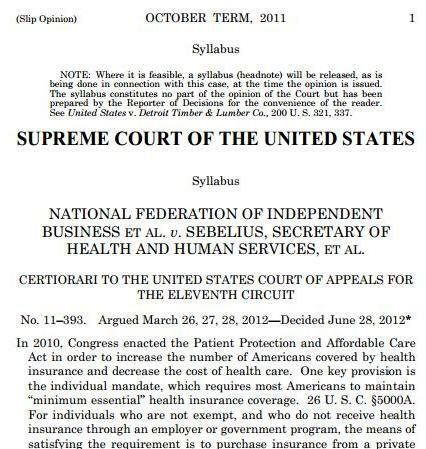 Download the US Supreme Court decision upholding ObamaCare here. This was originally uploaded in the US High Court’s website. The Supreme Court on Thursday upheld the individual health-insurance mandate that is at the heart of President Obama’s landmark health-care law, saying the mandate is permissible under Congress’s taxing authority. The potentially game-changing, election-year decision — a major victory for the White House less than five months before the November elections –will help redefine the power of the national government and affect the health-care choices of millions of Americans. Chief Justice John G. Roberts Jr. sided with the majority in voting to uphold the law, Obama’s signature domestic initiative. Passage of the legislation by the Democratic-controlled Congress in 2010 capped decades of efforts to implement a national program of health care. The legislation is expected to eventually extend health-care coverage to more than 30 million Americans who currently lack it. Republicans in Congress and GOP presidential challenger Mitt Romney have vowed to try and repeal the measure after the November elections. The health-care issue thrust the Supreme Court into the public spotlight unlike anything since its role in the 2000 presidential election. The court’s examination of the law received massive coverage — especially during three days of oral arguments in March — and its outcome remained Washington’s most closely guarded secret. The court reviewed four questions: whether it was within Congress’s constitutional powers to impose an “individual mandate” to purchase health insurance; whether all or any additional parts of the law must be struck down if the mandate is rejected; whether an expansion of Medicaid was unduly coercive on the states and whether all of those questions can even be reviewed before the mandate takes effect. On the Medicaid question, the judges found that the law’s expansion of Medicaid can move forward, but not its provision that threatens states with the loss of their existing Medicaid funding if the states declined to comply with the expansion. The finding immediately raises questions as to how effectively the federal government will be able to implement the expansion of the joint federal-state insurance program for the poor. The most crucial issue before the court was considered to be the individual mandate, known technically as the “minimum coverage” provision, because striking it down would jeopardize the ability of insurers to comply with other, more popular elements of the health-care law without drastically raising premiums. Under those other provisions, for example, insurers can no longer limit or deny benefits to children because of a preexisting condition, and young adults to up age 26 are eligible for insurance coverage under their parents’ plans. During oral arguments in March, conservative justices indicated they were skeptical about the individual mandate, the provision in the 2,700-page health-care law that requires nearly all Americans to obtain health insurance by 2014 or pay a financial penalty. Arguing the case for the Obama administration, Solicitor General Donald B. Verrilli Jr. defended the law as a constitutional exercise of congressional power under the charter’s commerce clause to regulate interstate commerce. He said lawmakers were regulating health insurance to deal with the problem of millions of people who lack coverage and therefore shift costs to the insured when they cannot pay for their medical care. (New York, June 28, 2012) – President Benigno Aquino III of thePhilippines has not fulfilled his promises to hold accountable the security forces responsible for serious abuses since taking office two years ago, Human Rights Watch said today. The Aquino government has not successfully prosecuted a single case of extrajudicial killing or enforced disappearance, including those committed during his presidency, Human Rights Watch said. Human Rights Watch today released a video, “Philippines: No Justice for Victims of Enforced Disappearances,” in which family members of the “disappeared” call on the president to live up to his promises of justice. Human Rights Watch, in its 2011 report “No Justice Just Adds to the Pain,” documented 10 cases of extrajudicial killings and enforced disappearances since Aquino took office. No one has been arrested in any of these cases, and the three “disappeared” people remain missing. The Aquino administration has not taken the needed steps to bring recent cases of serious abuse to trial, Human Rights Watch said. In his first State of the Nation Address in July 2010, President Aquino noted the case of Francisco Baldomero, an activist from Aklan province who was killed on July 5, 2010, as among those “on their way to being resolved.” An arrest warrant has been issued for Dindo Ancero in the case, but he has not been apprehended and the case was “archived” – put on hold – in January 2011. Human Rights Watch has monitored progress on cases of killings and enforced disappearances under the previous administration of Gloria Macapagal-Arroyo. If progress has been made, it is often because of the perseverance and courage of family members, rather than aggressive action by police and prosecutors, Human Rights Watch said. For instance, in the 2006 disappearance of two university students, Karen Cadapan and Sherlyn Empeno, family action was crucial in bringing the two soldiers to trial for their kidnapping and illegal detention. The trial for the two soldiers started in May. However, the men are not in civilian custody but are being held in a military camp. Two others implicated in the students’ disappearance, including retired Maj. Gen. Jovito Palparan, the commander in the area at the time, have evaded arrest. Human Rights Watch has received information that military and business interests are protecting General Palparan. In the past decade, state security forces in the Philippines have been implicated in the torture, enforced disappearance, and killing of hundreds of leftist activists, journalists, and clergy. The communist New People’s Army and other insurgent groups have also been responsible for killings and other serious abuses. Under President Macapagal-Arroyo, government security forces conducted a massive campaign targeting groups deemed to be Communist Party fronts and their alleged members and supporters. The number of killings and disappearances implicating the military has gone down under the Aquino administration, but they continue. The Philippines’s human rights record was scrutinized at the United Nations Human Rights Council in Geneva during its Universal Periodic Review in May. Several countries – including the United States, Australia, Germany, the United Kingdom, Spain, the Netherlands, and the Holy See – raised alarm over the continuing killings, enforced disappearances, and torture. During the sessions, several countries urged the Aquino administration to end impunity for these abuses. Human Rights Watch has longstanding recommendations to Aquino to initiate the comprehensive reforms necessary to end impunity for serious abuses. He should order the National Bureau of Investigation to investigate police and military personnel, including at the command level, who have been implicated in killings. He should also make clear to the police that they are responsible for vigorously pursuing any crimes committed by government officials and police officers and that if they do not, they will become the target of a criminal investigation. He should order the military to cooperate with civilian authorities investigating military abuses or themselves face sanctions. And he should take immediate steps to ensure that the country’s witness protection program is independent, accessible, and properly funded..